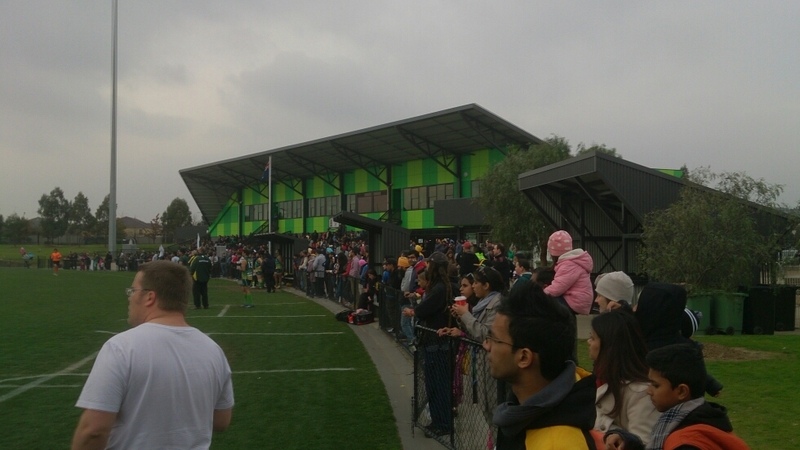 The day began with a pre-match event, which ran concurrently with the Essendon vs Richmond VFL curtain raiser. Guest speakers addressed the audience, team captains were jointly interviewed, bollywood dancers and drummers entertained whilst players shared meal. A number of guests were present, including Ms Manika Jain, the Consul General of India (Melbourne) and Mr Abdul Aziz Uqaili, the Consul General and Trade Minsiter of Pakistan (Sydney). The common message being that both Pakistan and India offered a great growth opportunity to Australian Football, given their large populations, a passion for sport and access to cricket fields. As Essendon vs Richmond concluded, a crowd of very non-traditional Australian Football fans began to grow, with a few possibly at their first ever match. Pakistan flags were waived alongside a solitary Indian flag. The Pakistan contingent was evidently larger, and very vocal in their support of their nation, clearly unperturbed by any underdog status. Following both national anthems, handshakes were exchanged and players took their positions on the field. Within the first minute Pakistan had kicked a goal, and inside four minutes they had a second. The crowd was getting excited and India looked shaken. A number of quick changes were made by India and the game slowed, although India was unable to get the ball inside their Forward 50. By Quarter time Pakistan held a 24 point lead and India was still yet to score. Pakistan opened the floodgates in the second quarter. After an initial kick gone astray, they added five unanswered goals. India finally managed a set shot, but it went wide. Pakistan responded with one more goal of their own in what was an exceptionally accurate quarter. They took a 60 point lead into the main break. India was more competitive in the third term but were unable to score. Several of Pakistan’s attempts at goal were spolied, however they still added two majors to increase their lead to 78 points by Three Quarter Time. The final quarter gave India cause for minor celebration as they managed just their second goal of the tournament, off the boot of Darius Fernandes. Pakistan added three more of their own and ran out 94 point winners. Pakistan were understandably euphoric as they were awarded the Dosti Cup, and celebrated accordingly!